Once again Tayo was at the centre of yet another impassioned brawl. This time around however the odds were stacking higher than ever against the two-time winner of the Star Gift. It all started with an drum used a pawn in what appears to be a sneaky ploy to spark something. Last night after the revelers made merry at the party and retired to their beds Tayo took to his djembe drum and started beating and chanting at the top of her voice. This sudden burst of energy, we had it under good authority from Ellah, was far from innocent as Tayo's very intentions were to stir. And break all peace and quiet he did. Some housemates viewed this as an affront by Tayo and a test of whether he could get away with pushing people's buttons. He chose the wrong moment to play his games and Macky2 expressed this to him in no uncertain terms. He snatched the djembe from Tayo, straddled him and beat it senseless over his head in case he missed the point. He then warned the drummer boy to stop it or else. It wasn't surprising to see that Tayo couldn't handle the taste of his own medicine as he stomped off in a huff and yelled empty threats in the garden. Mr. 265 could be seen whispering behind Tayo's back encouraging the others to let him at his outburst in the hopes that he would gain himself a strike which would cast him in a bad light which could only be good for "us", he said. This morning after their work out with fitness instructor Reggie, tempers flared and the topic was raised again. With a bruised ego Tayo entered into another screaming match with Macky2 and JJ whom he blamed for rousing sleeping dogs. JJ, backed by Macky2 and Mr.265, threw a slew of expletives, insults and birds right back at Tayo. Tayo's friend-turned-enemy, Samantha joined in only too glad to dismiss him as a big old cry baby. The caucus held by JJ, Mr.265, Macky2 and Samantha lead a smear campaign against Tayo to his buddy Frankie, who tried in vain to come to his defence. They all agreed that Tayo was too devious and foolish for his own good and if Frankie didn't watch out the bad company would corrupt. Meanwhile out in the garden Tayo called Samantha wicked and bitter. Nhlanhla reminded Tayo that this was only a game and that he shouldn't get carried away by his emotions. But it appeared that playing the very game was rendering Tayo a wishy-washy, overly-emotional type. Later on over breakfast Permithias sat next to him and started doing what he does best; make music. Singing "wake me up, if you see me fall, don't you let me fall, I have a heart of gold," inspired Tayo to pick up his djembe again and find some kind of healing in the music. Of course he was moved to tears in the process. 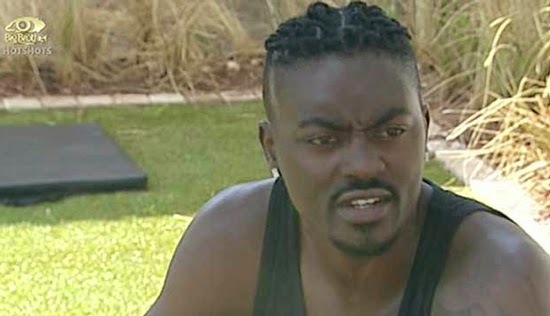 Do you think Tayo is losing his credibility or are his haters justified to hate? N yu hv d brain of a.........? Pls remind me again! ODE!!! What's wrong with Tayo? Yes, know Nigerians are loud but aii! This guy is stepping on each housemates' toes!!! Kelvin, Karen and Melvin were peaceful people! Why didn't you mention Uti abi wasn't he a winner? Haters!!! You cant do what you like and ask others not to do theirs. Samantha gossip when she want... Just like JJ, and others. Macky2 keeps jumping frm his bed to Sipe's... But they hate it when ever Tayo make a statement... What a conspiracy. Samantha think that she is everyone's friend right? Hahahahahaha! Wake up girl, this is a game! And stop the unsenseless Tayo hating. Tayo is the only reason why they have anything to talk about in that boring house. Judge not that thou shall not be judged. Tayo is the only one who knows what he's going through with this gang up. It looks his 2 time star meter win caused this intimidation. Why send Macky2 to drum on his head? Why can't 265 do it? From past bba shows this type of gang up does not pay in the end. Plotters always suffer for it. We are waiting and watching. Tayo is so real, no side talks or back stabbing, yeah they hate and gang up against him because he is not like them... I think those ganging up against another should know that Africa is watching... If you dnt like Tayo, then do ur own thing. This is a game, and am sure u dnt want him to be like you. He is proudly bragging about his fake country full of witch craft thievs killers and 419, Zambia might small but it is a peaceful country than his Ebola country. You sound so evil like your country I rebuke you and send back your evil words to you in Juses Name, my country is a Christian country we don't involve in blood money and so many evil things like yours and you cal it a rich country may God forgive u. You sound So stupid by talking ship about Ebola. I dnt even kn the diffrence btw ur poor Zambia with Ebola. And you cal that dirty country a rich country???? Hahahahahahaha shame on you. I wonder if dis BBA unites or divides Africa!!! We shall see! mrs.265 must b evicted.....stamped n sealed.